Last week we announced that GigaSpaces Technologies will continue its focus on in-memory computing and real-time analytics as we spin off our Cloudify business unit to concentrate on orchestration and cloud management. These are exciting times as we leverage our long-standing track record in the in-memory computing market, combined with our latest technology investments and innovation for our XAP and InsightEdge product lines to meet the needs of our customers and main market traction. This year, fast data analytics and cloud-nativeness are at the forefront of GigaSpaces’ product strategy. The combination of transaction and analytical processing (HTAP) for fast data insights supports our customers’ need to have seamless integration between applications and data science. That’s why our latest version of InsightEdge offers an Apache Spark 2.1-empowered analytics platform to facilitate full-spectrum analytics. In the fast-growing market for in-memory computing and analytics, organizations are realizing that traditional architecture, which separates the data workflow between transactional and analytical systems, cannot respond to business requirements in real-time, but rather only provide after-the-fact analysis. Moreover, Enterprises are discovering that they are still holding back when it comes to fully and meaningfully harnessing of their data due to limited experience, skills, and undefined best practices. Both Gartner’s HTAP and Forrester’s Insight Platforms address how the industry is witnessing a convergence of workflows and technology platforms for real-time, analytics, cloud, and in-memory processing to effectively address time-sensitive business decisions that involve the volumes of big data. As digital business dynamics continue to change the field of data and analytics, CIOs, CDOs, and other data and analytics leaders must evolve traditional approaches to focus on business outcomes, go with the market trends, benefit from algorithmic business, adopt new technologies and build trust with their customers. “Highly data-driven companies are significantly changing how they make decisions, improve operations, or use analytics to deliver products and services,“ said Adi Paz, General Manager of the IMC Business Unit at GigaSpaces. We at GigaSpaces understand the growing need for converge transactional and predictive analytics in real-time, as big data exponentially grows bigger. We’ve come to a realization that the solution to this is not radically changing an existing architecture, but rather extending it through in-memory computing to enable fast analytics and control against fast data. The combination of low latency streaming analytics, along with transactional workflow triggers, enables acting on data in the moment. Our recent collaboration with Magic Software Enterprises, a global provider of enterprise-grade application development and business process integration software solutions and a vendor of a broad range of software and IT services, is just one example of how GigaSpaces is helping organizations expand their offering for more complex scenarios. Using InsightEdge, Magic is able to provide its customers with fast data streaming and the ability to perform aggregations and calculation capabilities on the in-memory grid. Using the XAP data grid makes the streaming process it that much faster, hence eliminating the need for Hadoop. InsightEdge facilities Magic’s customer needs for the IoT deployments with predictive manufacturing and maintenance, enabling them to receive real-time, fast, data-driven events from their systems. 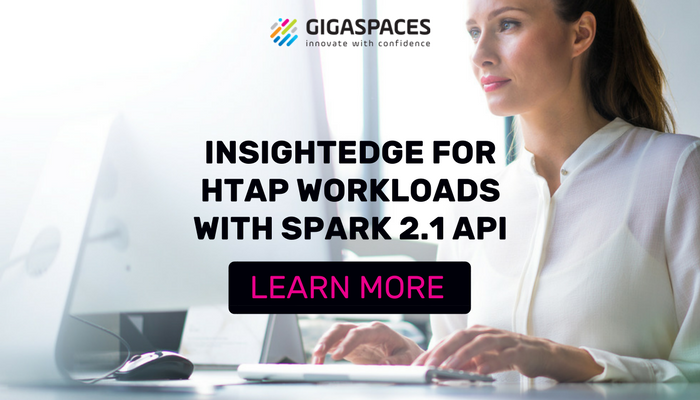 InsightEdge 2.1, supporting HTAP, is built upon GigaSpaces open source core in-memory data grid engine, along with Apache Spark 2.1 (for data science and analytics). More importantly, the simplicity of InsightEdge as a unified applications and analytics distributed platform accommodates economies of scope across organizations and enables tighter collaboration between developers and data scientists, allowing for greater organizational efficiency and immediate business insight. Apache Spark 2.1 support to enable Dataset API, continuous applications, and structured data processing. XAP Data Grid 12.1 open core engine for full-text search indexing, native persistence with customizable data preload from SSD, and RESTful grid orchestration. Improved Data Science Workbench with Apache Zeppelin 2.1.0 support. The flexibility of combining transactional and analytics functionality provided by InsightEdge and XAP is what separates GigaSpaces from the rest and we see excellent traction across different industry segments including Finance, Insurance, Transportation, eCommerce and much more. So, if your insight-driven transformation initiative is looking to spend more time generating value from your data, and less time managing the underlying infrastructure, then we invite you to let InsightEdge handle all the tough downstream components while empowering your organization to focus solely on unlocking insight. You might also benefit from our ongoing HTAP webinar series designed to address the evolving market requirements, challenges and recommended solutions surrounding big data analytics. The series relates to both concepts and includes real-world examples of solution architectures leveraging a platform which tightly integrates in-memory computing and a high-performance Spark distribution for insight and action at the point of decision. You will learn about the “why” and the “how” of HTAP capabilities and how HTAP database technology can help you directly from GigaSpaces IMC division’s VP of Products and Strategy, Ali Hodroj. For more on GigaSpaces Technologies, visit our site.